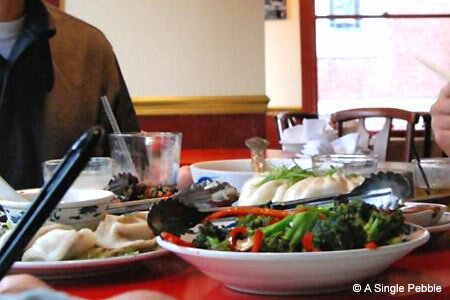 Inventive Chinese menu at this popular Burlington spot draws crowds, regardless of the season. : Boasting veteran waitstaff and an inventive menu (try the deep-fried shiitake mushrooms, masquerading as mock eel), this downtown restaurant offers authentic Szechuan with a fanciful twist. Chef Chiuho Duval's kitchen imports ingredients weekly from New York’s Chinatown. Among them are flavors you’re unlikely to forget: ginger eggplant or the rustic Ma Po bean cake: fresh bean curd, minced pork and chili peppers tossed in a robust, spicy Sichuan sauce. We like the attention paid to every detail: Tables are booked at two-hour intervals, and the owners request that cell phones be silenced. Now there's nothing to distract us from indulging in the tangy citrus wonderland that is tangerine-peel chicken or the crispy sesame beef. Each table’s Lazy Susan encourages a friendly intimacy that’s fun for groups and perfect for dates.